Stephen Strasburg’s second start saw the Nationals’ bats struggle to the point of embarassment against the White Sox’ Gavin Floyd, who faced the minimum through six innings. That feat came partially at the hands of some terrible running for the Nationals. They hit into two double plays, and took part in an ugly strike-em-out/throw-em-out DP in the 6th. Strasburg worked well tonight, though, notching 10 strikeouts (just one looking) through 7 innings pitched, giving up a just four hits. Two of those came in the first, a single and a bloop double that gave the Sox the chance to capitalize. After those two hits, Strasburg would retire 15 straight Sox, 9 on strikeouts, before allowing another runner. The Nats would strike in the 7th, turning a Zimmerman single and an Adam Dunn double to left center into a run, but they weren’t able to capitalize further, costing Strasburg a decision, as he’d leave after seven innings of work and 85 pitches. The back to back hits by Zimmerman and Dunn was the only place Floyd even looked human tonight, with no other consecutive base runners the entire night. Gavin Floyd was the story tonight, going 8 full, with 107 pitches (70 for strikes) and giving up just one walk and four hits. His pitches were confusing to the Nats the way the Internet is confusing to a caveman. You can just picture Caveman Will Ferrell standing around, staring at the pitches as they went by. The Nationals had no presence at all at the plate tonight, with just four scattered hits. In the postgame press conference, manager Jim Riggleman was calm, despite the close loss. He was very pleased with the outings from all of his pitchers tonight, with the Nats giving up just two runs in eleven innings of ball. He said there was “a lot of good” in the outing, despite the loss. When asked about the offense, he was quick to point out that the Nats were up against some serious pitching in Detroit, and again here tonight against Floyd. Most impressive in the face of the loss, though, was Stephen Strasburg himself, who answered questions for ten minutes after the game. When asked about the loss, he said that it was tough to feel good when the team is losing, and that it likely should’ve been an out against Juan Pierre in the first, when he fell just half a step behind trying to make the play at the bag. He was upset about his own at-bat in the sixth, when he was unable to advance Desmond on a bunt. Of all the people who didn’t have to make apologies tonight, Stephen Strasburg was the face of the team that was saying “I have to work harder.” He said he’ll be back tomorrow to work on his bunting, and his reactions off the mound to make those kind of plays. That’s the sort of maturity that you expect of a veteran player, not of a rookie in his third start. That’s just the sort of poise and determination that the Nationals need right now, and I’m glad they’re getting it, even if it’s coming from their newest face. Tonight’s box score showed some frustrating holes. Guzman, 0-4. 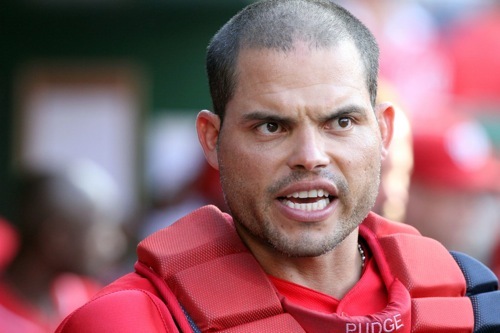 Pudge, 0-3. Morgan was 1-4 tonight, with three very lengthy at-bats against Floyd, seeing more pitches than any of his teammates by far, but just not able to get the ball in play. Adam Dunn continued his frustrating difficulty with runners in scoring position with two outs (now 1 for 28.) and that’s going to weigh heavy on any team, to see their cleanup guy struggle. 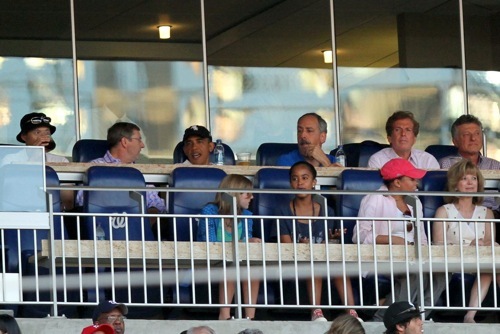 President Obama joined the festivities this evening, sitting in box down the third base line with several officials, and the owner of the White Sox, Jerry Reinsdorf. He brought his daughters along for the game, and the three of them sat just outside the suite in the gated area outside the glass. The visit was not announced to the press ahead of time, but Mark Knoller said it was an open secret he’d be there tonight. He saw a heckuva game, from both teams. Too bad the Nats couldn’t make a win out of it. I live and work in the District of Columbia. I write at We Love DC, a blog I helped start, I work at Technolutionary, a company I helped start, and I’m happy doing both. I enjoy watching baseball, cooking, and gardening. I grow a mean pepper, keep a clean scorebook, and wash the dishes when I’m done. Read Why I Love DC. Is there any way to filter Nats/Strasburg posts out from a user standpoint? I really like welovedc but come on, this continuous Nats coverage and ridiculous fawning over one player is way past irritating. Some days this seems more like some weird Nats fan page than a blog about DC food, events, history and so on. I’m sorry that you don’t like our coverage of the Nationals. 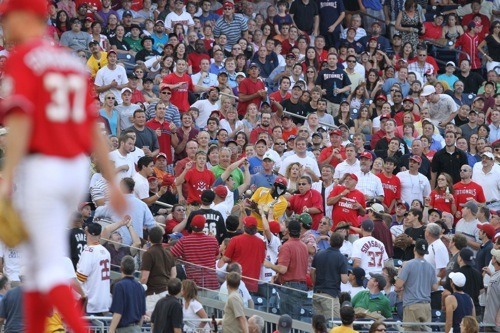 Strasburg’s the biggest thing to happen to baseball in DC since the team arrived in 2005. We’re covering the news as it happens, and right now that’s Stras. We’ve been granted unique status by the Nationals and MLB as one of the first blogs as part of the credentialed media, and so we’re doing daily coverage of their home games. We are a blog about the whole of DC, and we’re doing our best to provide balanced coverage of the whole city. Very few posts in the Feature column have featured the Nationals at all over the past few weeks, as a percentage of the site’s content as a whole. Can you tell me, are you an RSS reader, or do you visit the site each day? We might be able to generate a sports-free RSS feed. I live and work in the District of Columbia. I write at We Love DC, a blog I helped start, I work at Technolutionary, a company I helped start, and I'm happy doing both. I enjoy watching baseball, cooking, and gardening. I grow a mean pepper, keep a clean scorebook, and wash the dishes when I'm done. Read Why I Love DC.